Steve Bradley began formal study of Qigong and meditation in 1975. Accredited by three international teachers, he has taught at health clinics, hospitals, universities, schools, community centers, and Qigong conferences throughout the United States. He is accomplished in several Qigong forms, meditative techniques. He has a national certification in High Touch Jin Shin acupressure and as a meditation leader. Steve offers External Qi Healing sessions that balance and nurture the body’s Life Energy. Steve continues his teaching and life long study of Qigong while being an active presenter at numerous workshops and national Qigong conferences. Isabelle Mollien has been practicing Qigong since 2001. She has been certified in several Qigong forms. One of them is Radiant Lotus Qigong which was developed to focus on the specific organ systems of women to help in relieving Qi stagnation, releasing un-productive emotions, nourish the systems and restore hormone balance. Together, Steve and Isabelle are a powerful team of Yin and Yang energy! 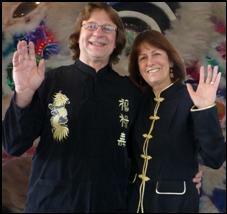 They are grateful to be able to share the Gift of Qi and love to share their passion for Qigong with their students. Qigong is cultivating the energy of life through posture, breath, movement, intention, and sound. Life energy or qi is gathered, cleansed, and circulated to prevent illness and improve health. Qigong is also a spiritual practice because it cultivates awareness and harmony with nature.